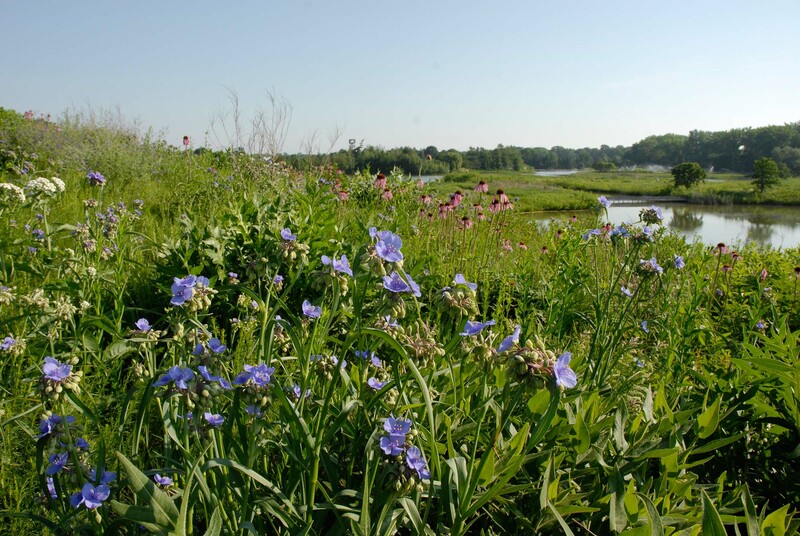 It’s time for a visit to the Dixon Prairie to savor late spring flowers and the pollinators visiting these plants. 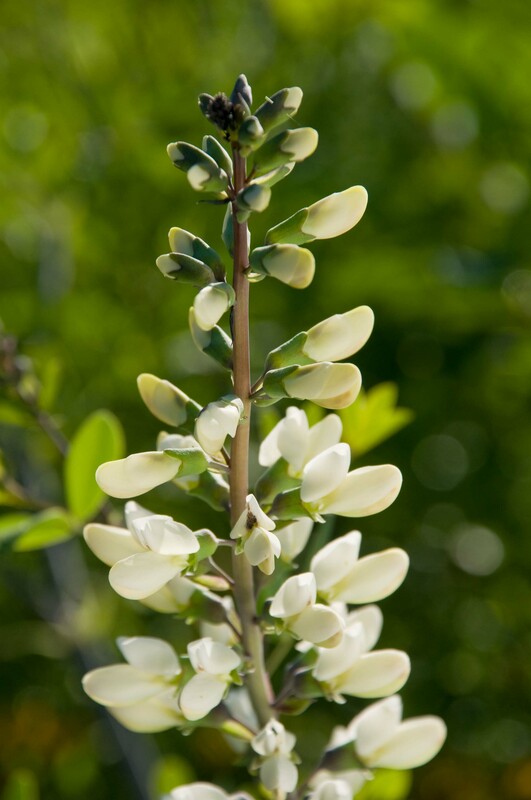 A standout plant, looking almost like a small shrub, is white wild indigo (Baptisia alba). This is the white-flowered cousin to blue wild indigo (Baptisia australis); this plant, not native to the Chicago region, was historically a source for blue dye. Both species are in the pea family. Many prairie plants belong to the pea family; other important families of the prairie are sunflower, sedge, and grass. Queen and worker bumblebees primarily pollinate white wild indigo. Their large size allows them to push down the lower part of the flower (the keel) and thus expose the pollen producing anthers. A rich palette of blue flowering plants from the Ohio spiderwort (Tradescantia ohiensis) surrounds the white wild indigo plants. A variety of bees and butterflies might be seen visiting these plants, bumblebees being the primary pollinator. Butterflies, in their quest for nectar, will not be rewarded for their visit, however, since Ohio spiderwort doesn’t have nectar. Spiderwort (Tradescantia ‘Sweet Kate’) and coneflowers bloom on the prairie. The prairie also currently hosts numbers of white tubular flowers, foxglove beardtongue (Penstemon digitalis). On the lower half of the flower is a large hairy sterile stamen (the part of the flower that produces pollen); perhaps this feature is the origin of the plant’s common name. Pollinators, primarily bees, must work their way past this sterile stamen to reach pollen. This effort increases the likelihood of pollen being deposited on the stigma, the organ that is receptive to pollen. Those willing to observe these flowers for a while might be rewarded with witnessing some territory defending. The male of an introduced bee, the European wool carder bee, with sharp spines on their abdomens, will attack other males who come in the vicinity of the female when she is foraging for nectar. Just opening on the gravel hill prairie is the pale coneflower (Echinacea pallida). The narrower leaves of this plant distinguish it from the commonly planted purple coneflower (Echinacea purpurea) (sometimes called broad-leaved coneflower). 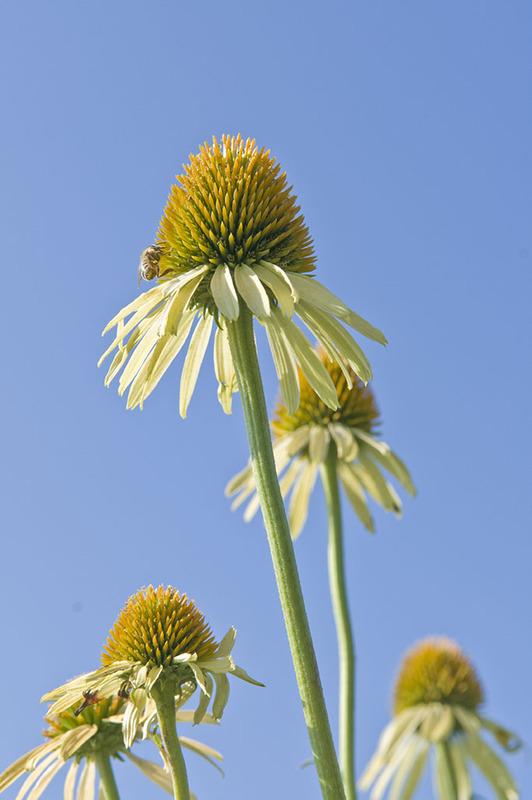 Like other members of the sunflower or aster family, the coneflower has what appears to be a singular flower but is actually a head of many flowers. This species has what are called ray and disc flowers. Some sunflower plants have only disc flowers while others, such as dandelions, only ray flowers. This plant is a preferred nectar plant of both bees and butterflies. Moving into summer, this palette will change and reveal a new tapestry of grasses and wildflowers. To witness the full bounty of the prairie, a prairie visit should be a weekly affair.